Played in the warm up house bands for The Nanny and Seinfeld and has also worked with Wayne Brady as well as smooth jazz keyboardist Scott Wilkie. 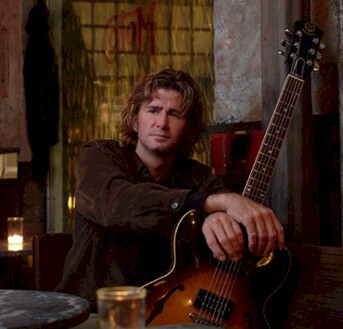 He leads his own group, The Matthew Von Doran Trio, and had his solo debut, In This Present Moment, released May of 2004. It was produced Jimmy Haslip and features Peter Erskine, Bob Sheppard, Terri Lynne Carrington, Derek Oles, Larry Goldings, Gary Novak, Bob Mintzer, James Genus, Marcus Baylor, Jimmy Haslip and Roger Burn. One of his secret weapons is the eleven string fretless guitar, which he plays on In This Present Moment and also on the track “What Now?” from The Big Picture. Burn says of Von Doran, “I first met Matthew on a casual; some silly wedding gig, about ten years or so ago. I recall really liking his vibe, but somehow, we just lost track of each other.